In situ chemical reduction (ISCR) refers to the in situ groundwater remediation approaches that principally involve contaminant treatment by chemical reduction. ISCR can occur via natural bigeochemical processes, catalyzed by in situ microbial activity, or by adding chemical reductants. Here, we introduce the basic principals and comment on the use of ISCR in remediation activities including outlining the common ISCR technologies available with links to more information. In situ chemical reduction (ISCR) has been given a variety of definitions since the term first started appearing in the late 1990s. In general, and for the purposes of this article, ISCR refers to the category of in situ groundwater remediation technologies where treatment occurs primarily by chemical reduction of contaminants. The emphasis of ISCR is on abiotic degradation processes, but contaminant reduction by biogenic minerals is included if the role of microbial activity in the contaminant reduction is indirect. The reducing conditions necessary for ISCR can arise from natural attenuation via “intrinsic” biogeochemical processes, or be generated by stimulation of in situ microbial activity (i.e. enhanced anaerobic biremediation), or be created by addition of chemical reductants. The fact that groundwater and sediment contaminants can be reduced by abiotic pathways (i.e., pathways that do not directly involve microorganisms) has been well documented in the research literature for more than 30 years. Most of the early work on these processes has been summarized in several reviews. More recently, there have been many academic studies of organic contaminant degradation reactions using model systems designed to represent the natural reductants that are most likely to be responsible for abiotic reduction reactions in soils, sediments and groundwaters. For example, Figure 1 illustrates conceptual models for ISCR of trichloroethene (TCE) by microbial metabolism that generates reductants. Minerals (or their amorphous analogs) that derive reducing properties from Fe2+. These include magnetite, green rust, ferruginous clays, goethite with adsorbed Fe2+, and possibly minerals commonly associated with basalt. Minerals deriving their reducing properties from S2- (or S1-) as well as Fe2+. The most-studied such minerals are mackinawite and pyrite, but other Fe2+ and S2-/1- phases of possible significance include greigite, marcasite and amorphous FeS. Molecules associated with natural organic matter that are active under specific oxidation-reduction (redox) potentials, which are mainly quinones, but could also include thiol groups and/or complexed metals. ISCR is now widely recognized as a major category of remedial options, encompassing a range of technologies including some that are well established, others that are emerging and a few that are still under development. There is not yet consensus around any one scheme for classification of ISCR technologies, but two approaches seem promising. 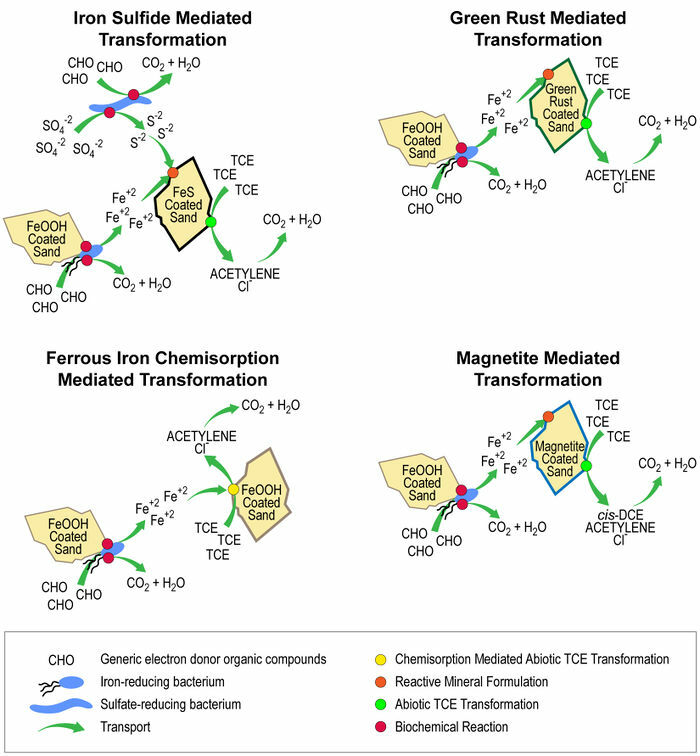 The approaches distinguish between technologies that are based on the relatively natural, “intrinsic” reductants (including minerals of geological origin or minerals formed by in situ stimulation of otherwise natural biogeochemical processes) and technologies that involve addition of chemical reductants that do not otherwise occur in nature (such as zero-valent iron and other metals). The blending of chemical reductants with biological amendments has been shown to be an effective strategy. Many commercial amendments are available that combine chemical reductants (especially ZVI) with materials that stimulate microbial activity (organic carbon in various forms), are available as commercial products. Figure 2 illustrates potential ISCR technologies as a continuum of “effective strength”, from relatively mild (generally natural) to stronger (typically engineered) reductants. Figure 2. Map of ISCR technologies in current practice. The horizontal dimension represents the continuum from naturally-occurring and/or mild reductants (e.g., Fe2+ and S2-/1- containing minerals) to the generally-strong chemical reductants used in fully engineered systems (e.g., Fe0 and Zn0). The vertical dimension represents the various modes of application, from emplacement of reductants to intercept plumes (e.g., permeable reactive barriers; PRBs) to injection of reductants that target the source zone (e.g., nZVI). Acronyms used to identify the specific technologies are defined in the following subsections. Abiotic MNA. The degradation of the contaminants as a result of direct reaction with mild reductants (mainly ferrous iron and iron sulfide minerals) that are generated from natural biogeochemical processes. Abiotic MNA applies only to contaminants that are relatively labile to reduction and concentrations of contaminants that are relatively small (e.g., ppb levels of trichloroethylene). Biogeochemical Reductive Dechlorination (BiRD). BiRD is the term coined by Kennedy et al. to describe the process of stimulating abiotic reduction of chlorinated solvents by forming reactive iron sulfides. In this scenario, iron sulfides are created by stimulating microbial sulfate reduction in the presence of iron. The application of BiRD requires the presence of sufficient carbon source, sulfate and iron. Carbon and sulfate generally must be added, and iron may be added although naturally present iron minerals are often sufficient. BiRD is primarily employed as a barrier technology, and to date these usually have been biowalls of mulch amended with gypsum and goethite. In Situ Redox Manipulation (ISRM). In soil matrices with significant iron (> 1wt%), applications of moderately strong chemical reductants such as sodium dithionite or calcium polysulfide cause reduction of the ferric iron associated with the mineral matrix. The resulting FeII-bearing minerals can then serve as the reducing agent to effect reductive transformation of contaminants. An example of such a process is the technology known is “in situ redox manipulation”, or ISRM, where dithionite (a soluble chemical reductant) is injected to reduce native ferric iron to adsorbed and structural ferrous iron, which can in turn reduce contaminants such as chromate, carbon tetrachloride, trichloroethylene and some munitions compounds. Catalytic Reductive Dechlorination (CRD). Dechlorination by noble-metal catalyzed hydrogenolysis has been adapted for in situ remediation of contaminated groundwater, and this process is being called catalytic reductive dechlorination (CRD). Although CRD has performed well in bench-scale tests, and at least one extended pilot test, deactivation of the Pd catalyst occurs, especially when groundwater contains sulfide. This deactivation is reversible upon treatment with a suitable oxidant such as sodium hypochlorite or air-saturated water. Improved catalyst formulations (e.g., incorporation of Au clusters on Pd or using zeolite supports to separate the Pd from constituents in the water that deactivate the catalyst) can improve resistance to deactivation and increase the time needed before regeneration. However, implementation of CRD using in-well recirculating reactors remains promising. The reduction of other common groundwater contaminants including perchlorate and nitrate by Pd-based catalysts has also been studied. Permeable Reactive Barriers (PRBs). Technologies that mitigate contaminant plumes by in situ placement of permeable, reactive material transverse to groundwater flow are known as reactive treatment zones (RTZs) or more commonly, permeable reactive barriers (PRBs). A wide range of materials (leaf litter, fish bones, activated carbon, etc.) can be used in PRBs to effect a variety of contaminant removal processes, but the most significant is granular ZVI in various forms. PRBs may be placed close to a source zone or down gradient (such as before a receptor), depending on site-specific considerations. Emplacement of the early ZVI PRBs was done by trenching, but now they often are constructed by hydraulic or pneumatic fracturing, soil mixing, or direct injection (of micron- or nano-sized ZVI). Several other ISCR technologies (e.g., ISRM and SZTI) can have operational characteristics that overlap with PRBs. In Situ Soil Mixing (ISSM). Relatively shallow contaminated sites can be treated by mixing with a variety of treatment agents using large-diameter augers. 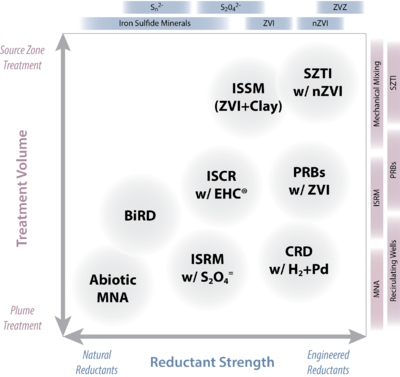 The most prominent example of in situ soil mixing for ISCR involves both ZVI and clay. Typically, a mixture of clay (5 to 10%) and microscale ZVI (0.5 to 2%) is mixed into a soil matrix using large-diameter (4-8 ft. diam.) augurs or soil mixers (e.g., Lang Tool). The clay can disperse any dense non-aqueous phase liquid (DNAPL) as a Pickering emulsion and can also inhibit the movement of contaminated groundwater by decreasing overall aquifer permeability. The mixing ensures uniform contact between the emulsion and the ZVI. The main application of this technology so far has been DNAPL zones, including to soils at depths as great as 50 ft. Source Zone Targeted Injection (SZTI). The injection of chemical reductants to directly target source zone contamination is not yet widely applied, but a growing range of applications is being considered. The reductants that have been most studied include ZVI (both micron- and nano-sized iron) and polysulfide foam, although other forms of chemical reductants are feasible. In general, the materials are either particulate (e.g., ZVI types) or liquids/foams. Particulate forms of reductant are attractive because they may remain resident and reactive in the source area for longer times than for liquids/foams and therefore provide residual treatment capacity. Recently, SZTI with nZVI has attracted a great deal of attention for these reasons, but the fine-particulate nature of this reductant raises other challenges related to longevity and emplacement, as discussed below. Calcium polysulfide has been used for the in situ treatment of hexavalent chromium source zones. In this treatment method, calcium polysulfide foam is injected throughout the source zone to reduce CrVI to the less mobile CrIII form. It has been employed at many locations in the U.S. and elsewhere . ^ Brown, R.A., Lewis, R.L., Fiaccom R.J., Jr., Leahy, M.C., 2006. The technical basis for in situ chemical reduction (ISCR). International Conference on Remediation of Chlorinated and Recalcitrant Compounds, 5th, Monterey, CA. ^ Brown, R.A., 2008. Developments in in situ chemical reduction (ISCR) technology. International Conference on Remediation of Chlorinated and Recalcitrant Compounds, 6th, Monterey, CA. Paper C-066. ^ Tratnyek, P.G., 2010. Chemical reductants for ISCR: The potential for improvement. International Conference on Remediation of Chlorinated and Recalcitrant Compounds, 7th, Monterey, CA. City, Paper No. D-054. ^ Becvar, E., Evans, P., Lebron, C., Stroo, H., Wilson, J.T., Wymore, R., 2008. Workshop on In Situ Biogeochemical Transformation of Chlorinated Solvents. Brooks City Base, TX, AFD-080429-058. 65 pgs.